The C-130 should actually be named the L-100 or L-100-30 (extended version) in their civilian forms. Oh Boy! can't wait, this is something I've been requesting for a long time. 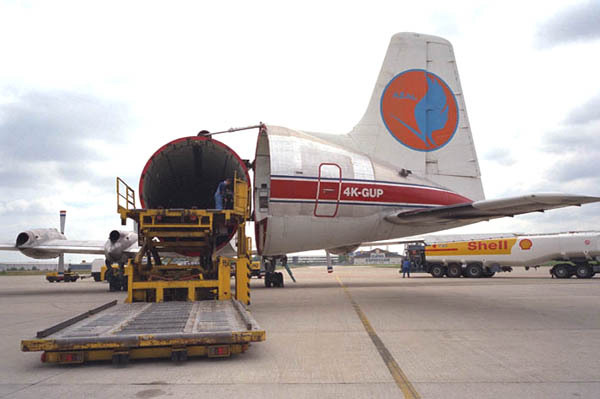 The single transport plane (Guppy) was totally inadequate as it would only transport boxed goods. Perhaps the names of the models were wrong. 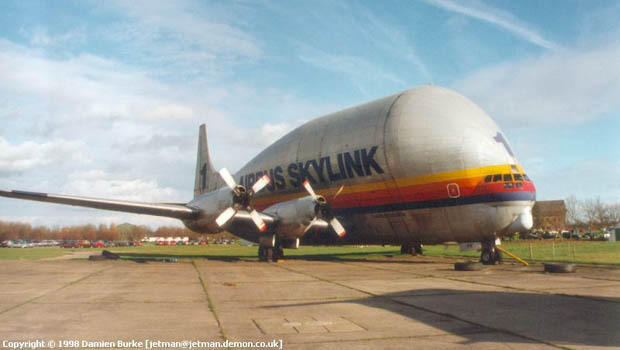 When I say Guppy family, I'm refering mainly to Mini-Guppy, Super-Guppy, Pregnant-Guppy and CL 44 Skymonster models. How about the Airbus A300-600ST Beluga as the latest stage of the guppy-formed planes? Using freightplanes, take care of the correct loading procedure! I think there's already a Beluga made by Raven, that's why It was discarded. Ah ok - didn't know that. Just in case I was misunderstood. When I referred to the "Guppy" I meant the one that is already included with the PAK's. Ahh...was that, now I get it. Well, that plane can be easily improved just modifying the dat file, to increase its capacity up to, let's say 100 or 150 units. IMHO, there's no need to create it from scratch, so I would not include it in this pak. 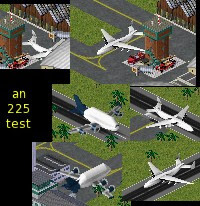 The first tests with Antonov an 225. I've some problems with the scale and I need your help/advice. As you can see the an225 is smaller than the Beluga, and AFAIK, in real life is the other way. 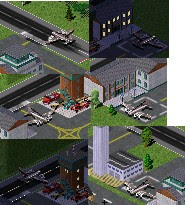 But I can't make it bigger because it gets out of the 64x64 tile...Any idea? Well, you did see the thread with "big planes"... so what are you waiting for? Make it as pak96 (just make sure to align it correctly) and bye bye, Beluga! A preview of the An 225 (pak96 scale). I've to improve several things like the texture (quite plain) and the bright (needs dirt) but imo the size is right. I might deform it but I think it looks good enough. 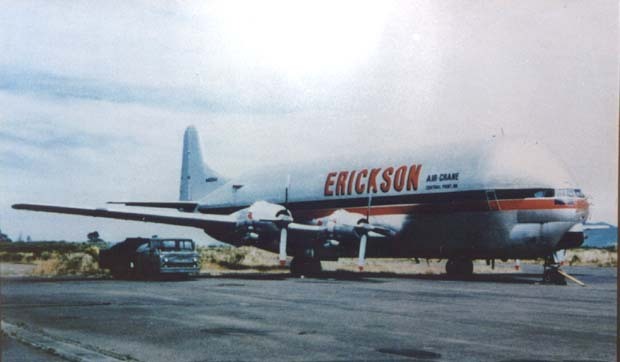 I have doubts with the price (currently 159.250 cr, more than the Airbus) and the running costs (79.15 cr) I think they are quite balanced, taking into account that it will be the largest plane on the game. The most expensive plane that transport passengers is the A380 that cost 129.000 cr so imho, it makes sense that the largest freight plane costs at least that amount. What do you think? 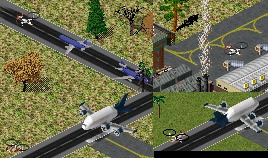 Hey, finally this great plane is getting into Simutrans! Unfortunately 64's pricing is outside my scope. - running cost: 105 cr. And the results show that although it's the most expensive plane in the game, it's a money making machine! In the tests, I only used 20% of capacity (100-121 out of 500) and all I can say is that the profits are around 50-60%. I guess that there's some influence of the bonus speed....I must find the correct values to keep it balanced, so I'll do some tests more with a higher running cost value, and after that I'll post the release. P.S: next one will be VTM Atlant, a russian gas/petrol carrier. A preview of the VTM Atlant,the first and probably the only plane that can carry petrol/gasoline in Simutrans..
EDIT: the preview image is updated. I had a problem, a big problem. The plane is done but seems that Simutrans does not accept heretics so it doesn't load the plane, at least with 99.17 or higher. I've also tried with nightlies (r2052) and I can't make it work. 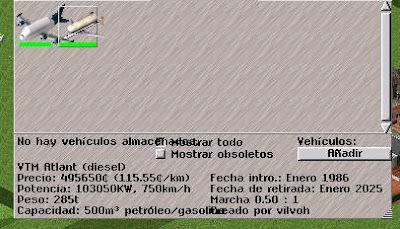 Actually, I can't find where's the bug because I did some test with 99.04 (the version I usually make test with) and, although the plane didn't carry petrol/oil, at least the game loaded the plane, and it was shown at the air depot window....is there any restriction in that sense? is it actualy possible to transport oil/petrol by air? Does your pak file have a suitable size? Sometimes makeobj doesn't report a problem, but just builds an incomplete .pak file - and I figured the best indicator is file size. The pak file size is 8,58 KB. I'm using pakhelper with the latest makobj (49) I attach the source files in case you want to try out. The old pak file takes 11,3 KB, and I've realized that it works!!! As you said, must be something related with makeobj. I've checked the pak.log that Pakhelper has, but there're no warnings or errors. Anyway I've tried with the old pak and the nightly r2052 and it works as it should. Thanks for the help, DirrrtyDirk! P.S: the plane will be ready in a few days. P.S: it's the civilian version, of course. Nice! And quite true to reality again. P.S: Next one is Blackburn Beverly B-101, a 1950's plane from the Royal Air Force.